“But we preach Christ crucified….folly to those who are perishing…but to those who are called…the wisdom of God” (1 Cor 1:18,23,24). A Way far above our own is wholly evident to us as we gaze upon the One we have pierced (Jn 19:37) and “lifted up” (Jn 3:14, 12:32) on the Cross. As we “lift our eyes” (Jn 4:35) to see him ‘lifted up’ we see the paradox, the stumbling block, and the folly (1 Cor 1:23) that the Cross presents: death brings life. Accepting Christ’s call to “Follow me” (Jn 12:26) and to “come and see” (Jn 1:39) we are, through our experience, able to glimpse with our hearts, souls, and minds a small piece of the wisdom of the Almighty. For at the deepest recesses of man’s sin lies an inherent distrust of the Creator. When we sin, we doubt the wisdom of God, we doubt that He knows what is best for us, and in our human pride, we choose our own path. But through Christ’s ultimate act of trust, believing that after death he would rise and be glorified, he asks us to do the same. When we too choose the Cross, we reverse the pattern of distrust by believing in a paradox. It is the ultimate way to show our trust, not in the present situation, not in the ephemeral feelings, not in our natural passions, but in Him, His love, and promises yet unseen. When we choose the Cross, we unite our hearts within the same trust the Son gave to the Father that allowed Him to die with the belief that only through death could life come. But we must choose it, and in order to do so, we must first stand with Mary at the foot of the Cross (Jn 19:25) and gaze upon the one we have pierced (Jn 19:37). We must learn from Him. Just as on the road to Emmaus, Jesus begins the story of man’s salvation with the story of the necessity of the Cross (Lk 24:26). The “Good News” begins on Calvary. In fact, when Peter tries to deny that the Christ must suffer, he suffers a harsh rebuke: “Get behind me Satan” (Mt 16:23). For Jesus knows that the grain of wheat must fall to the ground and die before it can bring forth life and fruit (Jn 12:24). 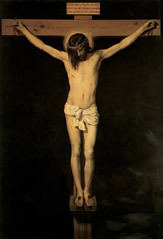 However, this command of the Cross brings with it a natural human disgust and distress (Mt 17:23). It seems impossible; it evokes fear and loathing. But Jesus consoles us: “Do not fear, only believe” (Mk 5:36). Believe. “This is the work of God, that you believe in him whom he has sent” (Jn 6:29). What does it mean to believe? Since we are called to be imitators of Christ (Eph 5:1), we look to Him for our example. Consistently in the Gospels, and especially in that of John, Jesus criticizes the actions of the Pharisees by pointing out their unbelief (Jn 8:45). Faith, or belief, results in action, and it stems ultimately from trust. When we believe, we inherently trust, and therefore we obey. As mentioned before, sin, at its root is distrust in God and His love for us. Jesus came primarily to right this distrust of man, by choosing to believe in God by perfectly obeying His will: “I do as the Father has commanded me, so that the world may know that I love the Father” (Jn 14:31). For this he was born (Jn 18:37). Love leads to obedience. Jesus could not be more explicit in requiring the same from us: “If you love me, you will keep my commandments” (Jn 14:15), and “if a man loves me, he will keep my word…” (Jn 14:23). Where did obedience lead Him? “He became obedient unto death, even death on a Cross” (Phil 2:8). As a pioneer in our salvation (Heb 2:10), we are called to follow Him, to be made perfect through our suffering as Christ was (Heb 2:10). In fact it is only suffering that can perfect obedience in us (Heb 5:8), for in suffering we are forced to trust past the present moment to promises of future glory yet unseen. In Hebrews 11, Paul commends numerous examples of faith for following the paradox of sacrifice in the yet unseen Cross. Abraham, in His trust, chooses to sacrifice his only son. In faith, he chose to leave his homeland for promises never seen on earth. In trust, Noah built an ark, sacrificing his pride, choosing to build amidst a rainless country and probable ridicule. These men possessed faith, knowing that without it, it is “impossible to please God” (Heb 11:6). They chose to “share ill-treatment…rather than enjoy the fleeting pleasure of sin” (Heb 11:23), for they knew that obedience to truth leads to “an eternal weight of glory beyond comparison” to the transient things that pass away (2Cor 4:17-18). These exemplary men understood that faith and subsequent obedience stems from love of God (Js 1:12), and in faith these men acted out of love. In trust, Jesus acted, choosing the Cross, out of love for the Father and us. It is “by that will that we have been sanctified” (Heb 10:10). Our own sanctification also has its end in obedience (1 Pt 1:2), for the Lord knows that only in obedience are we living according to our destiny of eternal fulfillment of being one with Him in heaven (Jn 17:22). “As the outcome of your faith you obtain the salvation of your souls” (1 Pt 1:9). But before eternal glory, we must first obey unto death on the Cross. We must carry about in us the death of Jesus, so that might live with Him (2 Cor 4:10). Therefore, let us stand with His Mother at the foot of the Cross and contemplate the One we have pierced so that we might walk the path with Him. In the Garden of Gethsemane, Jesus asks us to pray and wait the night with Him (Mt 26:36); His and our journey begins here in the Garden, but will we choose to accompany Him and stay awake (Lk 22:46)? In the Garden, Jesus begins His journey in the depths of His heart and soul – His will. This is where our journey begins as well. Without conforming our will to God’s will, we cannot act, and we cannot walk the road of the Cross. We must enter into the sacrifice of obedience and say with Jesus, “not my will, but thine, be done” (Lk 22:42). In this prayer, he transcends the flesh and its abhoration of suffering, and embraces the divine spirit and its desire to conform to the will of the Father. We see further evidence of Jesus’ absolute control of His human passions in His trial with the high priests and Pilate. As they question and demean Him, He “gave them no answer” (Mt 27:14). When every human instinct compels Him to speak and act, He is able, with poise and certitude, to hold His composure. Christ calls us to do the same when faced with our Cross. We are not to be a wave of the sea tossed about by the wind, (Js 1:6) but a rock in perfect control of ourselves, never doubting the will of our Lord. This is no easy task. In the beginning of His ministry, Jesus performs 3 years of signs and miracles. He called Nathaniel to discipleship by miraculously reading his heart (Jn 1:48). He manifested Himself first to Mary through the miracle of the Annunciation (Lk 26-38). He showed Peter, James and John His full glory on the top of Mt. Tabor during the Transfiguration (Mt 17:1-9). But all of these events eventually culminate in the Cross. All of these people are eventually called first to witness the Cross of Christ, and then to participate in it themselves. Though Peter asked Christ to remain of the top of the mountain surrounded by His full glory (Mt 17:4), Jesus shows him that the mountaintop is not where the Christian life on earth is led. Instead, He takes them from the mountain into the valley below (Mt 17:9). It is here in the valley that we are asked to live ours lives, among the toils, hardships, and difficulties, away from the glory and the light. Like Peter, James, and John, we are often allowed a glimpse of the glory to come, but this is only to invigorate and strengthen our faith for present and future trials. The revelations of His glory usually hide a call to further embrace the Cross in our lives at a deeper and more difficult level. The Way of the Cross is found in the valley. It is a long difficult ascent to the top of Calvary after we are already beaten and bruised. We come down the mountain of Tabor to climb up that of Calvary. It is an ascent of “patient endurance” (Rev 1:9), but it is through this patience that we “inherit the promises” (Heb 6:12,15). It requires endurance on the Way of the Cross to do the will of God (Heb 10:36), but fortunately, if we persist, we will be among those, not who shrink back and perish, but those who have faith, and therefore walk the way and keep their souls (Heb 10:39). Persecution and suffering is the “call for the endurance and faith of the saints” (Rev 13:10). Fortunately, along the Way of the Cross, Jesus promises that he will not give us more than we can endure. Often, just when it seems that we cannot walk another step, he will send Simon of Cyrene to lay “on him the Cross” (Lk 23:26) or his angels from heaven to strengthen us (Lk 22:43). Like Peter, he will allow Satan to “sift us like wheat” (Lk 22:31), but He prays for our faith not to fail (Lk 22:32), and when we are counted amongst those who have shared in His trials and endured (Lk 22:28), we will eat and drink at His table in His kingdom (Lk 22:30). “For we share in Christ, if only we hold our first confidence firm to the end” (Heb 3:14). And when we inevitably fall, we must rise again, but now with the ability to “strengthen our brethren” (Lk 22:32). It is this profound transformation we seek to make. As we continue to rise after our falls, just as Christ did on the way to Calvary, we become “perfect and complete” (Js 1:4) and are transformed into Simon of Cyrene, instead of being aided by him. We long for Jesus to ‘lay on us the Cross’ so that we may console and unburden His aching body and heart. It is this longing to run toward the Cross, to share and take part in the sufferings of Christ, that we should aspire towards. We should desire to be those who “complete what is lacking, for the sake of his body, the church” (Col 1:24), and not among those who, obeying the desires of the flesh, run from the Cross, away from the hard and narrow way that leads to life (Mt 7:14). It is a victory of the spirit when we choose to ‘lay on ourselves the Cross.’ But the Cross does not end on the walk to Calvary, but at Calvary itself – in death. “He loved them to the end” (Jn 13:1). We are to die (Mt 10:39). It is not a partial renunciation of our wills. It is a total, complete, and utter emptying. We are to sell everything we have and follow Him (Mk 10:21). It is this utter death to self that convinces the onlookers to exclaim, “truly this was the Son of God” (Mt 27:54). It is this death that convinces the good thief to repent (Lk 23:41). This witness of total death is what converts our brethren. We are not to heed to the ridicule of the onlookers to save ourselves and come down from the Cross (Mt 27:40-43). With Christ, we want to be counted among those who endured to the end and were saved (Mt 10:22). The Cross is our witness. In the act of death, Christ demonstrates to humanity that the Father can be trusted, even in our darkest, most desolate, and despairing hour. Amidst our confusion and darkness, we are, with Peter, when given the option to walk away, asked to say, “Lord, to whom shall we go? You have the words of eternal life” (Jn 6:68). This is what Christ comes to show. His Cross, and our Cross when we choose to carry it, both work to rehabilitate the trust in the Father that is forsaken in every instance of human sin. The Cross of Christ and our Cross are one and the same. In the moment of complete death to all personal preference, when we choose to trust against all perceivable logic, we witness to and participate in the trust of Jesus in the Father as He says, “Into thy hands I commit my spirit” (Lk 23:46). Only through the paradox of the Cross can we repair the doubt present in every human sin, and begin again to trust Him Whom can be trusted. How do we know He can be trusted? Because He rises and says to us, “Fear not, I am the first and the last, and the living one; I died, and behold I am alive forever more” (Rev 1:18). He is the light that shines in the darkness, and “the darkness has not overcome it” (Jn 1:5). For Jesus who is in us “is greater than he who is in the world” (1 Jn 4:4). He shows us that He is so powerful and mighty that he can take the punishment itself, death, and turn it into the path which leads to life (Heb 2:14). The Cross, and the subsequent life that flows from it, is the “working of his great might” (Eph 1:19) that brings glory to God (Jn 12:27). For through death and the Cross, Jesus reconciles us back to oneness with the Father (Eph 2:16). It is only through his death on the Cross that He can be crowned with this glory (Heb 2:9). Why does Christ bring glory to God through his death? Because He does the Father’s will: “I glorified thee on earth, having accomplished the work which thou gavest me to do” (Jn 17:4). 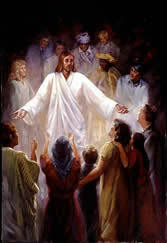 We are called to do the same thing; by our deaths, either physical or spiritual, we are to bring Him glory (Jn 21:19). When we choose to share in His death, by uniting our wills to the will of the Father, we become partakers in His glory (1 Pt 4:13, 5:10). For when we die to our own wills, we allow God to work in us instead, and He is then able to manifest His power. Renouncing our will to that of the Father is conversion. When we choose this, we choose to recognize that God knows best. Unlike the apostles during the storm on the sea, we do not want to cry out to Jesus, “Teacher, do you not care if we perish?” (Mk 4:38). We do not want to awaken Him to hear Him say, “Why are you afraid? Have you no faith?” (Mk 4:20). We pray instead that we are docile enough to endure the storms in faith, knowing that Jesus is with us in our boat, trusting in His perfect will in our lives. We hope to let Him sleep. Conversion and trust in Him also requires from us a deep recognition of our own misery and unworthiness. We are to cry out to God, “Have mercy on me a sinner” (Lk 18:13), and hopefully, like the good thief who chooses to recognize his guilt (Lk 23:41), we will also like the good thief have Christ say to us, “today you will be with me in Paradise” (23:43). It is only with the humiliation of Christ, “who for a little while was made lower than the angels” (Heb 2:14), that we can be highly exalted with Him (Phil 2:9). For only in the humble emptying of self-love can we allow God to fill us with His love and raise us with Him. It is for this reason that we can “count it all joy” when we meet various trials (Js 1:2), for in trials, we restore our trust in God, and we are brought to perfection and completion (Js 1:4). It was for joy that Jesus chose to endure the Cross, despising its shame, but looking ahead to the joy it would bring – our salvation (Heb 12:2). Conversion brings God joy. Choosing His will over our own is conversion. When we, like the Prodigal Son through his sufferings, come to realize that our will does not bring fulfillment or happiness, and we choose to return home to the Father to do His will, He will, with joy, run out to greet us and welcome us home (Lk 15:11-20). “Therefore let those who suffer according to God’s will do right and entrust their souls to a faithful Creator” (1 Pt 4:19). More importantly, let us move, with the unselfishness of Christ, toward participation with Him in the redemption of the world (Col 1:24). Let us mold ourselves into Simon of Cyrene and desire to carry with Christ the sins of the world on our shoulders. Let us look upon the one we have pierced (Jn 19:38) and allow ourselves to be pierced in turn. For if we allow ourselves to love others by making ourselves a victim with Christ, we allow the world “see” God who is not seen (1 Jn 4:12), and we can become the pierced hands through which Christ enters the world. We are not afraid of what we are about to suffer (Rev 2:10). Instead, we long to be gold refined by fire (Rev 3:18), and we long to have our blood flow from the wine press (Rev 14:20) so that we can be baptized by the blood and water of our Lord that flows from His side on the Cross (Rev 19:34). In the obedience of our will that stems from love, we seek to sell everything we have (Mk 10:21) and join Him on the road to Calvary. But first, to learn from Him, we must stay at the foot of the Cross like Mary, and lift our eyes to gaze upon the One we have pierced.